Information, tips and articles to inform you of academic issues and ideas to help you achieve educational success. In this video I'll show you 3 ways to supercharge your learning experience using the SpeakToYourMind Flashcard Desktop App. 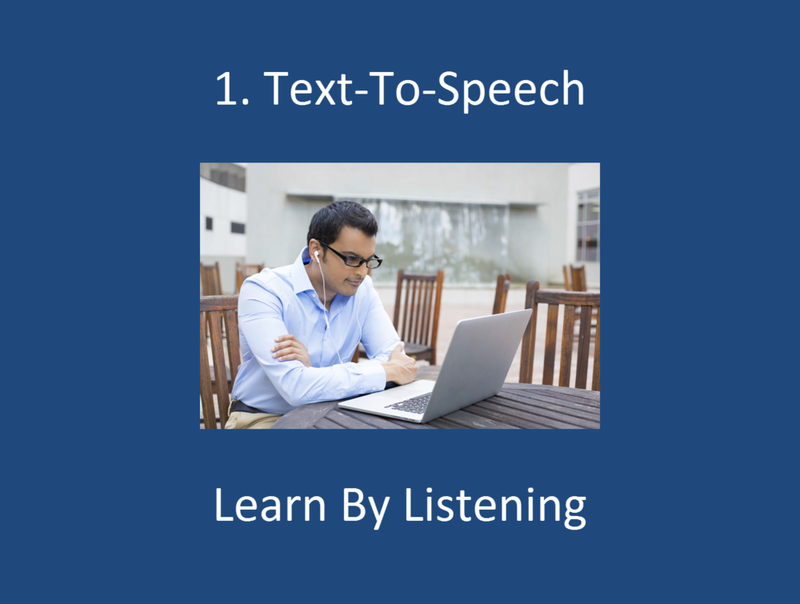 In this video I'll show you why using text-to-speech, word highlighting, and word captioning will supercharge your learning experience. First, using the Study Manually module as an example, SpeakToYourMind uses the female and male text-to-speech voices built into Windows 10 to speak a flashcard question and answer out loud. I've turned speech on and we'll use Microsoft Zira Desktop for this example. Microsoft Zira Desktop speaking: What is the name of the river that flows from Lake Itasca in Minnesota to the Gulf of Mexico in Louisiana? Microsoft Zira Desktop speaking: The Mississippi River, also know as the Mighty Mississippi. If you like to learn by listening, you will benefit by using your auditory sense. Second, the new highlighting feature is synchronized with the voice. I'll turn highlighting on and we'll use Microsoft David Desktop for this example. Watch as each word is highlighted as the question or answer is being spoken. Microsoft David Desktop speaking: How many feet tall does a hill have to be in order to be considered a mountain? Microsoft David Desktop speaking: A hill has to be at least 1,968.5 feet tall, or 500 meters, to be considered a mountain. Word highlighting helps increase your attention span and learning retention. Third, the new captioning feature is also synchronized with the voice. In this example, I'm using the Study Automatically module and Microsoft Zira Desktop. As the flashcard question or answer is spoken, each word is captioned in real time in a separate area at the bottom of the screen. Microsoft Zira Desktop speaking: What is the longest river in the United States? Notice the captioning at the bottom of the screen. Microsoft Zira Desktop speaking: The Missouri River, which is about 2,540 miles long. Word captioning increases vocabulary and word recognition, and also improves reading and listening comprehension. As you've seen in this video, the benefits of the new word highlighting and captioning features combined with the benefits of text-to-speech give you 3 ways to supercharge your learning. Why not experience all of the powerful learning capabilities and benefits of SpeakToYourMind today by downloading the 14-day free trial available on our website. Supercharge your learning with SpeakToYourMind, and take the guesswork out of studying. Happy Digital Learning Day 2018! SpeakToYourMind Flashcard Desktop App for Windows 10 helps you learn digital flashcards quickly and easily. Take the guesswork out of studying!